This past Thursday, Disney and Marvel awoke fans with a surprise Avengers: Endgame trailer. It was the first full length sneak peek after dropping a teaser and a Super Bowl spot. It's been confirmed by Marvel boss Kevin Feige that all of the footage show in these previews, which clocks out to just under four minutes, is only from the first twenty minutes of the movie. So has everyone seen enough before the movie hits theaters this April? That's what Marvel's Marketing VP Dustin Sandoval wants to know. He asks this on Twitter. So, should Avengers: Endgame get any more trailers? Sure, there will be TV spots, but as we've seen in the past with movies such as Star Wars: The Last Jedi and Infinity War, these will most likely be cobbled together from the already existing footage, and edited in a fun, new, fresh exciting way without giving away too much more. 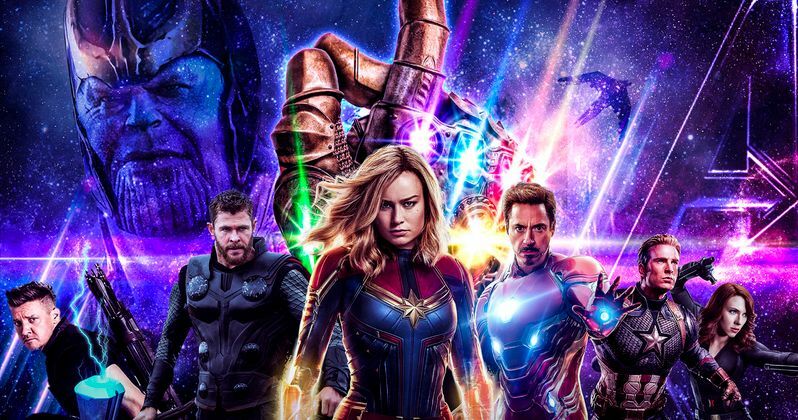 Leading up to the release of the first Endgame teaser trailer, it appeared that a majority of the fans would have been happy not seeing anything from the movie before its release. Can a major studio actually sell a sequel without any trailers? It almost appeared for a while that might be the case. And we're experiencing something similar with J.J. Abrams' Star Wars 9, which is holding out on a trailer a lot longer than usual. The latest Avengers: Endgame trailer actually offered up more than fans were expected. It arrived just a few days after Captain Marvel made its big debut in theaters. So it finally showed what her team-up with Earth's Mightiest Heroes will actually look like. The post-credit scene in that movie is actually an Avengers: Endgame teaser, with Carol Danvers arriving at Avengers headquarters after Steve Rogers and team have discovered Nick Fury's pager. The latest footage also shows that Tony Stark survives being stranded out in space. After Captain Marvel is in theaters for a few more weeks, Disney and Marvel could just release that Post-Credit scene as a teaser clip, and generate enough interest in the release leading up to those final moments before the big premiere. Most fans will have already seen it at least once. And getting to see it for free online might get everyone pumped. It's not known when tickets for Avengers: Endgame will go on presale. When that happens, the movie is usually accompanied by a new trailer or TV spot. So it will be interesting to see how the Marvel marketing team handle this one. It's possible that the presale campaign will arrive with a number of exclusive posters from various theater chains. As that's what's happened before. In all likelihood, we'll at least get a few more TV spots, perhaps a behind-the-scenes sizzle reel or featurette. But no, I don't think we need another trailer. And I'm going to guess a lot of you are on board with that. This question comes to us from Marvel Marketing VP Dustin Sandoval.